You know what they say about fashion in 2015: everybody wants to look like a motherfucking hobo. 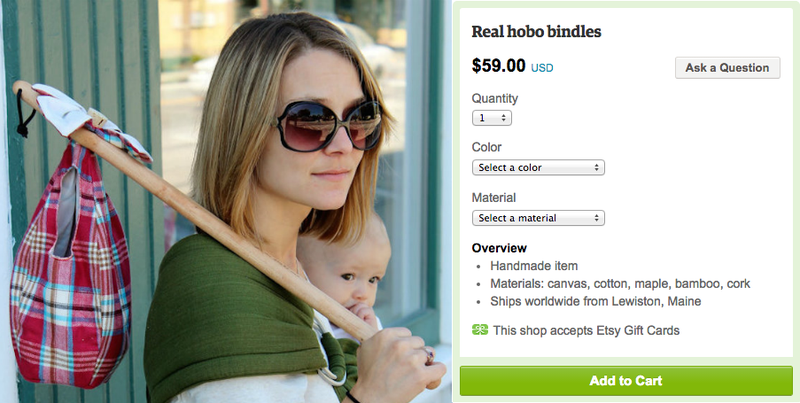 So here’s a tremendous bargain from the Etsy shop BagsOnSticks, a “real hobo bindle” that’s also a model of simplicity and customization; aspiring Etsy hoboes have five different fabrics to choose from for the bag and two different wood types to ponder for the stick. I crunched the numbers for about 15 minutes and came up with ten different ways to be a stylish, authentic hobo, and none of them will cost you any more than $59. “It is a durable bag asking to be used,” states the product description. Hell yeah. For those who don’t quite want to look like an old-fashioned bindlestiff but still want a bit of that ultra-appropriate hobo flavor, you can also purchase a more modernized version for $75.